L-Tryptophan is an essential amino acid, meaning the human body does not produce it naturally, but is required for the body's healthy functioning. L-Tryptophan is present in a wide range of foods including beans, nuts, milk, and poultry. L-Tryptophan is a precursor to 5-HTP (which is a precursor to serotonin) and is sold as a sleep aid and mood enhancer. L-Tryptophan was banned by the FDA in the 1990s because of contamination in the production process, but was re-released onto the U.S. market in 2001 after the FDA published a revised estimate of the risks. 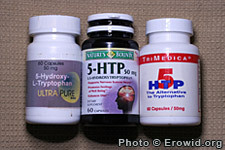 During the 1990s, 5-HTP was sold for human consumption in the US and grew in popularity partially because L-Tryptophan was unavailable. Ask Erowid: Does 5-HTP Cause EMS? A Profound Journey - Retrospective, by Andrea P.
Snopes: Does turkey put you to sleep?